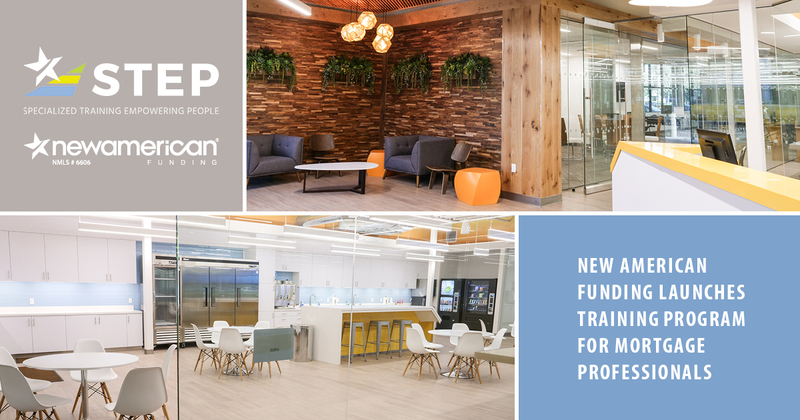 New American Funding, a leader in the mortgage industry, announced today the launch of its new STEP program, a corporate training curriculum that's designed to prepare people for a career in mortgage banking. STEP, which is Specialized Training Empowering People, is a nationwide program that was developed by the company to equip people for working in every aspect of the industry. STEP provides live weekly online and onsite classes that cover a spectrum of topics ranging from the fundamentals of mortgage banking to compliance education to the specifics about loan products. It's designed to train people who have no background in the industry to work in a diverse scope of roles including Loan Originator, Underwriter, and Processor. "It was vital that New American Funding develop STEP because it addresses a long-term need we've had within our industry for new talent. We have a younger generation looking to enter mortgage banking; yet, there hasn't been any comprehensive training available to prepare them for a career in this field." said CEO Rick Arvielo. "We see STEP as the right thing to do for our community, our industry, and our next generation of mortgage leaders." One component of STEP includes Launch Lab, which features a 25,000 square-foot, state-of-the-art training facility that's opening in Orange County, CA. Launch Lab is a program that's designed to accommodate approximately 200 people per session. It will provide on-the-job training for both industry newcomers and experienced mortgage professionals who want to transition into a different career role. "This is a great way to not only create jobs for communities across America but to create jobs in an aging industry," said Arvielo. "We believe it will be a win, win for everyone." The goal is to expand STEP to include an on-demand, e-learning curriculum that employees take at-will.